Mark Cosgrove’s courageous century and a defiant rearguard action from Rob Sayer and Richard Jones earned Leicestershire a draw and denied Derbyshire a first championship win of the season in the Division Two match at Derby. The Leicestershire skipper defied the pain of a damaged left hand to score 110 but looked destined to finish on the losing side when his team slipped to 242 for 8, chasing 347, with 23 overs left. But Rob Sayer and Richard Jones, who batted with a runner, denied Derbyshire who used seven bowlers to steer Leicestershire to 301 for 8. Any prospect of a Leicestershire victory looked remote when Palladino struck twice in the first three overs of a day which began with the ground shrouded in mist with the floodlights on. Angus Robson’s dismal run continued when he was caught behind down the legside without scoring for the second time in the game which was his third consecutive duck and his fifth in 11 innings. Harry Dearden was promoted to number three but scored only two before he edged low to first slip where Wayne Madsen took an excellent catch but that was Derbyshire’s last success until eight overs after lunch. Although Cosgrove was in considerable discomfort and took his left hand off the bat handle almost every ball, he was playing not only with great courage but also authority to put Leicestershire back in the contest. With Horton also looking secure, Derbyshire were in danger of seeing the game slip away from them but Palladino made the breakthrough when he beat the opener’s forward defensive push to have him lbw. Horton was clearly unhappy with the decision but Neil Dexter joined Cosgrove to bat through the rest of the afternoon and at tea, another 149 were needed from 38 overs. It was Palladino who revived Derbyshire again when he angled one back into Dexter who was lbw for 26 but the key wicket was Cosgrove who completed a memorable hundred, his fifth of the season, when he forced Callum Parkinson through the covers for his 15th four. He survived a rapid chance to Madsen at slip on 105 but made only five more before he drilled a drive to mid off and showed his dismay by staying slumped over at the crease for several seconds before departing with an angry swish of his bat. Eckersley’s reaction after he was given out caught behind down the legside crossed from disappointment to dissent and, following the departures of Mark Pettini and Clint McKay, left Leicestershire with only survival to play for. They achieved that thanks to Sayer and Jones who was dropped off his own bowling by Parkinson with eight overs left which proved to be Derbyshire’s last chance. 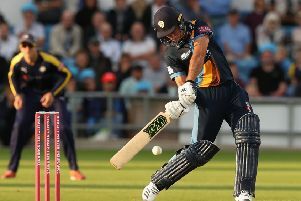 Derbyshire captain Billy Godleman said: “I really thoroughly enjoyed the four days of cricket. Obviously we are really disdappointed we didn’t quite get over the line but I’m extemely proud of the way the guys fought really hard this week. “A couple of times today when it looked like we didn’t have a chance of winning we came back and that’s really positive signs for the future. “The real pleasing thing is we’ve had some major contributions in the game from our senior players, Wayne (Madsen) played incredibly well in the second innings and Tony (Palladino) really led the attack as he has done all year.